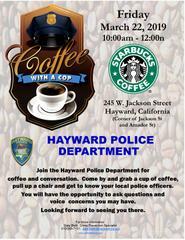 REMINDER: "Coffee with a Cop, March 22nd 10am-12noon, Starbucks, 245 W. Jackson Street - Hayward"
Join the Hayward Police Department for coffee and conversation. Come by and grab a cup of coffee, pull up a chair and get to know your local police officers. You will have the opportunity to ask questions and voice concerns you may have. Looking forward to see you there.